Ryno and I had a full weekend of activities. Saturday he and Elton went to visit a friend and brew beer while I went to the Austin Craft Riot as well as the East Austin Studio tours with a co-worker. I had a great time at the studio tours. We saw such a broad spectrum of amazing art, but my favorite part was actually seeing the artists' studios. Some of the studios were even in homes, which felt very intimate and personal in such a great way. I love seeing the spaces where people create. Also, my parents arrived in town Saturday evening, so we went to Z Tejas near the Arboretum. The patio where we were seated had a large stone fireplace and the view overlooking the hill country was gorgeous. I wish I had taken some photos, but the sun had already set unfortunately. 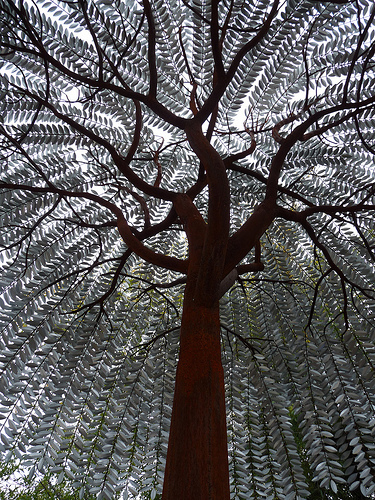 The photo below is of a large metal tree we saw at our last studio stop. It was absolutely gorgeous. 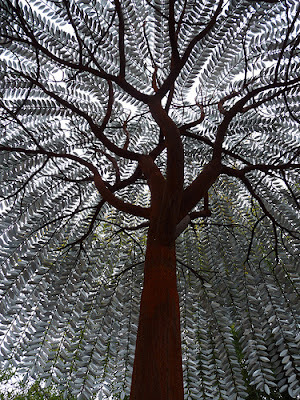 I want one just like it in my yard one day, so I can sit underneath it all the time.